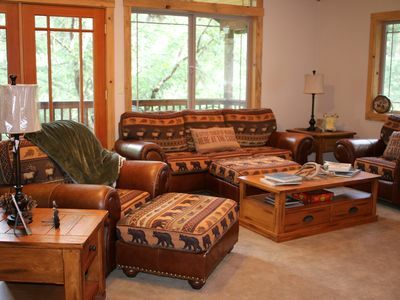 GRAND LODGE ON THE TRINITY RIVER: Fish, Relax, Cook, Unwind. Dog-friendly! 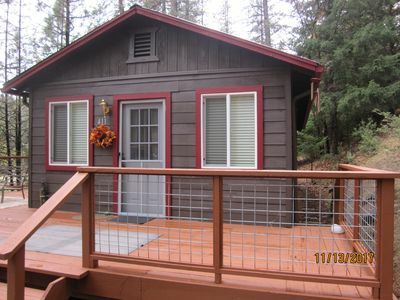 You'll enjoy this spacious and elegant cabin with its unique lofts. The view from the log bed of one is all sky, mountains, trees and river! The large kitchen, dining and living areas are perfect for cooking, dining and relaxing with your companions. Alpen Glow is our grandest cabin. 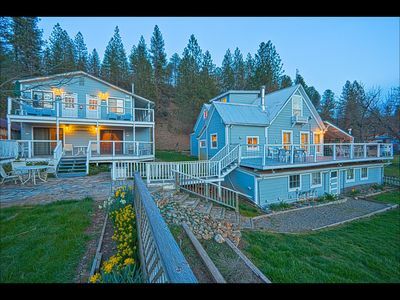 It looks out on the very close Trinity River and is located just off Steel Bridge Road between Lewiston and Douglas City. 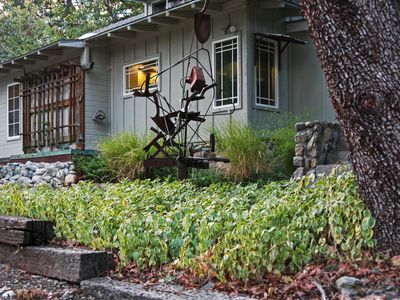 It has a great deck with stairs down to the sweeping lawns bordered by huge trees and the river. This is a prime fall spot for salmon (summer-fall) and steelhead (winter-spring). Trout are in the river all year, including big German browns. 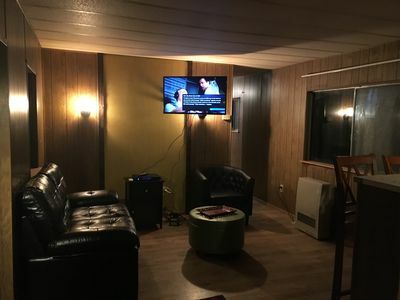 Some groups such as fishing clubs and family reunions rent all of the cabins on the property for total privacy, but each one is oriented so that you don't feel crowded. Alpen Glow has a huge kitchen with an Italian tile counter and bar. There is a gas stainless steel cooktop in the center island that's surrounded by tile and butcher block, making meal prep a delight. It has a stainless steel side-by-side refrigerator and large dishwasher. The big pantry is well-stocked with the basics, plus lots of serving ware and nice touches for the table. There is a Keurig coffee maker (we provide some K-Cups but bring your own, too). There are reusable pods to use your coffee in the Keurig as well as a standard coffee maker. The dining table expands to seat 10 and the expansive living room has a really pretty electric fireplace with beautiful 'flames,' as well as a whole-house furnace and swamp cooler. Also in the living room: the bookcase with great reads, a flat panel TV with satellite TV, plus a DVD/VCR combo and lots of good movies. Furnishings are tasteful with fine art and many antiques. Several sliding doors open onto the enormous river deck which has a dining set, umbrella and many deck chairs and lounges. Graceful arbors over riverside sliders on the deck have beautiful seasonal flowers and vines. The shared BBQ patio is great for roasting marshmallows, star gazing and tall tales. Alpen Glow has two unique lofts upstairs (separate sleeping areas that don't face each other but are open to different views) plus 1 traditional bedroom on the main floor. The Master Loft has wonderful mountain views from the California King log bed; a wood stove with wood provided; a private deck with river view; a sitting area, a privacy screen that may be moved; a queen futon and a built-in daybed; a Jacuzzi tub (not a hot tub); double vanity; and a private shower and toilet. The closets are so large, we put a twin bed in one with plenty of room left over to accommodate an adult's or kid's gear. It's grander than a Harry Potter bed under the stairs, and great for parents to stash a kid, or for a single adult. There is a good reading light in it and we also have portable reading lights for use anywhere. The River Loft has an incredible view from the plush, pillowtop queen log bed: it consists solely of river, mountains and sky! There is a full tiled bath (shower/tub combination; toilet; vanity) on the main floor, right next to the main floor bedroom and just around the corner from the living room or kitchen. 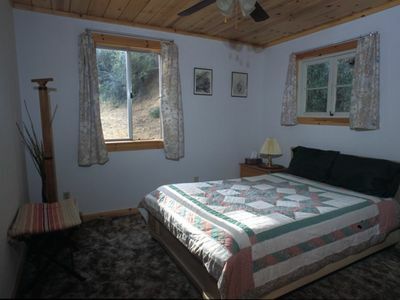 The bedroom has a fine queen wrought iron bed and a twin bed, too. It has dressers, a closet and a work station on one side of the closet for telecommuters to work in private. 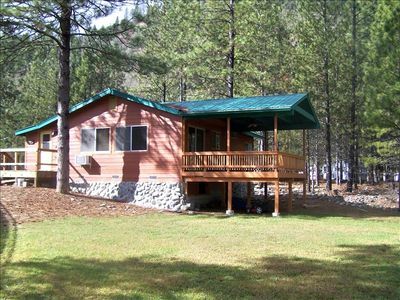 Alpen Glow is one of our 5 great cabins on, or very close to, the river and part of a three cabin complex on prime Trinity River frontage. All have Wi-Fi and a land line phone (shared). We have everything from a romantic Miner's Cabin with a magical ambiance @ about $150/night to Alpen Glow, which has a very high WOW factor. 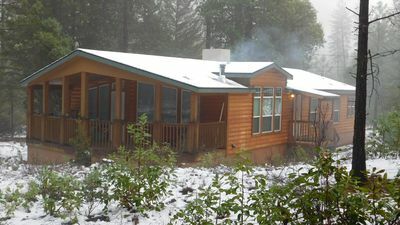 Because you can rent all 3 cabins here, this is a dandy location for reunions, quilters and company off-sites. It's also perfect for small weddings. All or most of your wedding party can stay right there! You're close enough to mix with everyone else, but not too close. We have a parking area at the beginning of our property that's large enough to easily turn around with trailers on your vehicle, and plenty of parking space. You can unload, then just park it. Great for boats and larger vehicles, and boy, does this make fishing guides happy! Rates are for up to 7 guests. If approved, you may be able to add a few more guests. 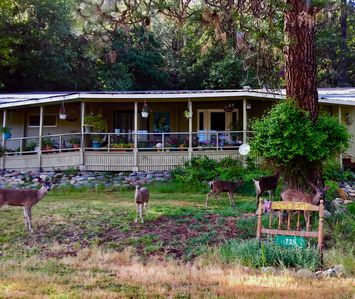 We limit numbers to keep each cabin's septic system happy, as well as in consideration of water use. If approved, additional guests are $15.75 each per night. Please contact us for discounts on stays of over 2 nights. Ask us about rates for stays of a week or more, which might be deeply discounted, especially in shoulder seasons (Sept-Oct and March into part of May). We offer kayak, raft, cataraft and stand up paddleboard (SUP) rentals, lessons and guided trips. Our guided kayak trips include a lesson before departure. We are very good at teaching and supply everything you need. 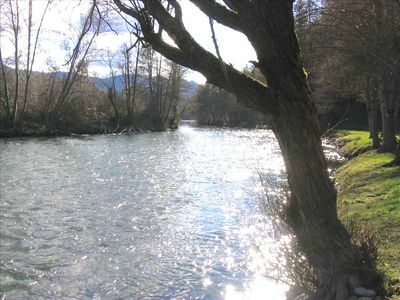 The river has gentle meanders with some mild but still fun rapids; or you can paddle on Lewiston Lake, which is also stunning (wonderful birding: great blue herons, bald eagles, golden eagles, osprey & more; we often see great blue herons, osprey, night herons and occasionally, bald eagles on our river trips). We prefer Lewiston Lake to Trinity Lake because it has a 10 MPH speed limit, resulting in a peaceful place to SUP, kayak with kids and dogs, and fish. All raft trips on the river are guided by us, but you can rent a raft for lake use, too. If you'd rather raft and/or kayak the river unguided, we can arrange inflatable kayak (not great for steering, but very forgiving of rocks) and raft rentals. We offer free stand-up paddleboard lessons and demos at our place (about 15 minutes upriver) and rent wonderful inflatable SUPs that you can carry in their backpack in a very small vehicle, then pump up at the lake. Our hard boards offer even more options for you! Pristine, stream-fed ponds just a few miles away provide warmer water than the river for floating on a tube, and are a nice option for families with small kids. If you made it this far, then you know a lot about our cabins and the area, but you probably have questions and we'd love to answer them, so drop us an email or give us a call. You really are going to love this place! 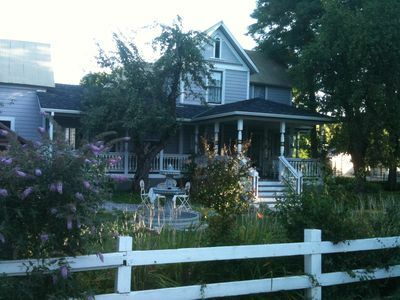 Trinity River Rental House, NEW: Free Wireless Internet and new Flat screen TV!! 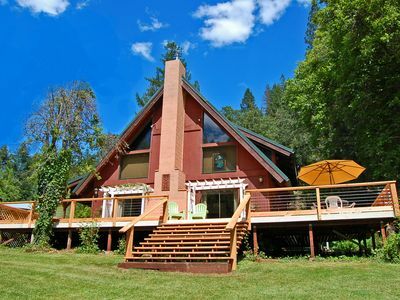 Beautiful country lodge on the Trinity river. 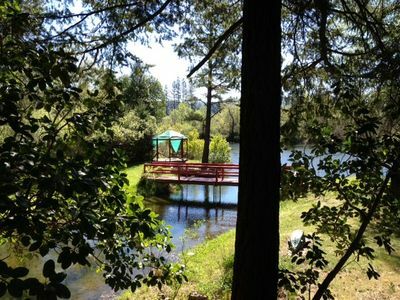 Private Get-Away - Relax, Fish, Explore!